Last week, I told you guys about my failed promise of not using any technology for an entire week. The reason for my failure? PlayStation Home. My friend told be there was a new update for Home for the season. It was an Easter update! Veemee’s Acorn Meadows Park was being redecorated for an Easter celebration! Now, in the Philippines, we don’t really celebrate Easter the way Western cultures do. Over here, we go to church to sort of pay respect for the resurrection of Jesus after being crucified. For people in the United States and Europe, it’s all about finding eggs that were placed by a magical bunny. I’m not trying to poop on anyone’s culture but it’s just so weird that the same day has such vastly different ways to celebrating it. 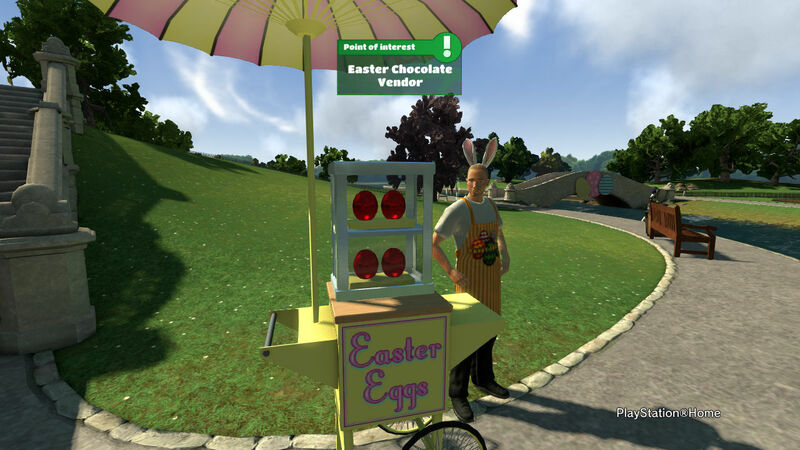 After going to church and having some cereal, I immediately hopped on to PlayStation Home to see what an American Easter is like. I’ve never ever participated in this sort of thing so I was excited to see what kind of stuff I’ve been missing out all these year… in the virtual world, of course. The first thing that caught my eye was the big bunny across the ways. I never really understood how the Easter Bunny came to be or why the animal was chosen to represent Easter in the first place. It caught my attention because… it was a huge bunny! Yes, I know it’s only a virtual bunny but it was still an impressive huge bunny! It was one of those things I wish I could climb and take a selfie on top of its foot and pretend it was a King Kong Bunny or something. Besides its size, there weren’t any available interactions so I did some more exploring. I know bunnies poop out pellets… but how big would his pellets be? I did find something I wanted to try out in real life: chocolate bunnies! This is one of the things I’ve sort of been obsessed with ever since I saw one on TV. I’ve actually actively been looking for something like that here in the Philippines but they never seem to carry it. Must have to be because we don’t celebrate it the way Americans do. So even though it wasn’t a real chocolate bunny, I really wanted to get one. At least my virtual Robin can enjoy one. It’s a good thing I had some acorns (the currency for the area) left and I got one. I really wanted to, at the least, watch her bite the head of the chocolate coated critter (which I think is the reason why they’re so popular). Too bad it was so tiny I couldn’t really tell if she already did when I made her eat it. It just made me want to see if I can actually find one in the Philippines. The sign is incredibly misleading. There was another activity I found while there: Easter Egg Hunts. This is another thing I really wanted to do as a kid but never got to. While it’s slowly becoming a practice in the Philippines, I don’t think they’d allow an 18-year old college girl to hunt for eggs with toddlers, would they? I was pretty disappointed with this since, after I did activate the game, I couldn’t find a single egg! Maybe I’m just too stupid or I wasn’t looking in the right place. I didn’t get any instructions on how to actually search for them, too! I actually quit after 5 minutes of trying, which is pretty embarrassing as this is a game meant for kids! Maybe it saw I was an adult and made it difficult for me. That’s the excuse I’m telling myself right now, by the way. At least point me to the right direction, you smug rabbit! All of these activities made me really want to do the real thing. It made me really want to chew off the head of a helpless chocolate bunny and climb over a bunch of ten year olds in search for colored eggs (don’t judge me). Maybe next Easter I’ll be able to make my dream come true. Oh, there was one thing I saw interesting that wasn’t Easter related. 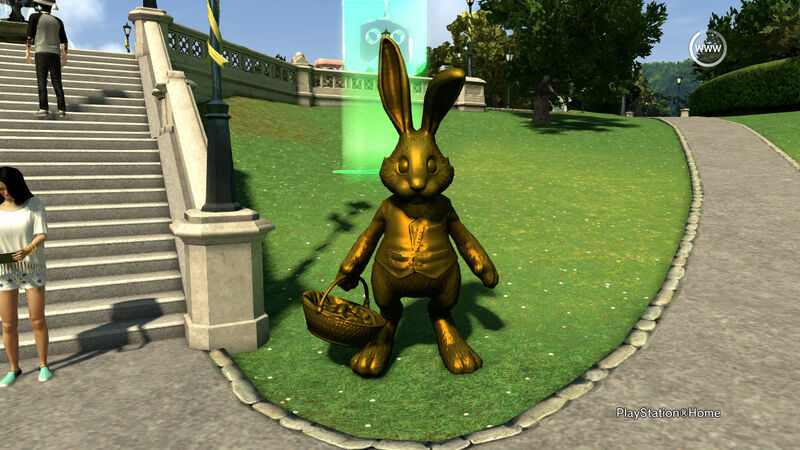 But it was something I really wanted to see even way back when I started logging into PlayStation Home. And I’ll tell you all about it… next time! How did you celebrate Easter? Let me know in the comments below!